New action is added: TrvActionInsertEquation. It can be used to implement "Insert | Equation" command. 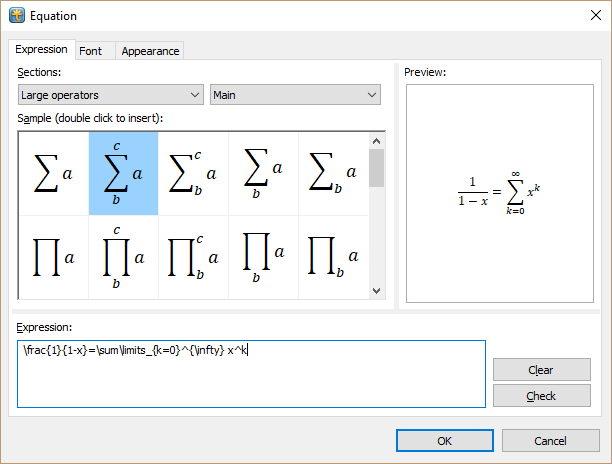 Normally, it displays an equation editor dialog, allows to compose an equation, and inserts this equation in the caret position. Alternatively, it can insert a predefined equation without displaying a dialog. - background color, border, spacing. TrvActionItemProperties ("Format | Object Properties" command) also displays this equation editor for editing the current equation. Localization: in this version, the equation editor is translated only in English and Russian. More translations will be available soon. TRichView saves \protect keyword in RTF, if both rvprModifyProtect and rvprDeleteProtect are included in Protection of text. \protect is ignored by the most rich text editors, but is supported by TRichEdit. Requirement: equation editor requires RAD Studio XE4 or newer. It includes minor tweaks, and updated translations. More translations will be updated soon. Spanish translation of Report Workshop is revised. In this update, we used our own trial generation utility instead of third-party tools. Everything was double- and triple-tested, but if you find any problem, please inform me. SrvDxSkin is included in the setup (in ThirdParty\SRVDXSkin folder) and installed automatically if ExpressSkins are available. This component allows using ExpressSkins (developed by DevExpress) with ScaleRichView. It changes appearance of editor, scrollbars and rulers. Report Workshop + ScaleRichView integration units are included in a separate runtime package (they were not included in any package in older version). TRuler has a new property: TickColor, it is used to draw tick marks and tab stops. Only a few languages are remained (Hungarian, Malay, Slovak). Thai was excluded from the list of languages available by default, because it was not updated for quite a long time. It will be returned back when we find a volunteer Thai translator. PS: the installer version is 16.15.4, but it contains TRichView 16.15.3. This installer version was incremented because some additional components were updated after TRichView 16.15.3 has been released for registered users.